Trademark 'em – Eastland Music v. Lionsgate: Can a movie title infringe the name of music group? Eastland Music Group owns the registered trademark Phifty-50, the name of a rap duo. Eastland also claims a trademark in 50/50. Lionsgate released a dark comedy in 2011 titled 50/50 starring Seth Rogen and Joseph Gordon Levitt. The title of the movie refers to one of main characters fifty-fifty chance of survival after he learns he has a malignant tumor in his spine. The district court dismissed Eastland Music’s complaint for failure to state a claim holding that that the movie’s title was descriptive of the plot. Eastland appealed to the United States Court of Appeals for the Seventh Circuit. On appeal, the Seventh Circuit focused on whether the title of the movie has actually caused confusion as to its source, rather than whether the title was descriptive. this complaint fails at the threshold: it does not allege that the use of “50/50” as a title has caused any confusion about the film’s source—and any such allegation would be too implausible to support costly litigation. See Ashcroft v. Iqbal, 556 U.S. 662 (2009); Bell Atlantic Corp. v. Twombly, 550 U.S. 544 (2007). During oral argument the court questioned Eastland’s counsel about the lack of confusion. The attorney admitted that no one ever contacted Eastland claiming confusion about the source of the film. At oral argument, plaintiffs’ counsel conceded that not a single person has ever contacted Eastland or its web site to seek a copy of the film or complain about the film’s contents or quality. Nor does the complaint allege that any potential customer has turned to Lionsgate or Summit in quest of the rap duo’s products. The court further noted that 50/50 has been used as a title for numerous films, many of which pre-date Eastland’s use of the mark Phifty-50. The phrase 50/50 or a sound-alike variant (50-50, fiftyfifty, fifty/fifty) has been in use as the title of intellectual property for a long time. Wikipedia lists eight films with that title, opening in 1916, 1925, 1972, 1981, 1982, 1992, 2004, and 2011. See http://en.wikipedia.org/wiki/ 50/50. Six of these movies predate Eastland Music’s use. The 1982 film is by and about a rock band. Wikipedia lists three TV shows with that title, plus an episode of a fourth show. It also lists three songs whose titles contain the phrase 50/50. One of these is Frank Zappa’s 1973 song “50/50”. Then there’s “50/50 Luv” released in 1995 by the rap group B.G. Knocc Out & Dresta. And Wikipedia’s list is not comprehensive, for it omits anything by the rap duo Phifty-50; doubtless other examples also are missing. 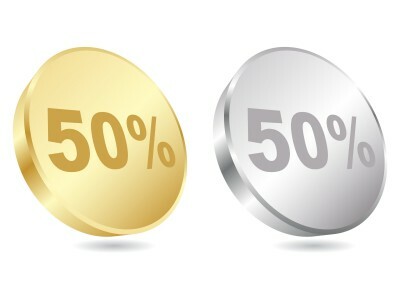 If there is any prospect of intellectual property in the phrase 50/50, Eastland Music is a very junior user and in no position to complain about the 2011 film. Phifty-50 entered a crowded field, and its rights are correspondingly weak and narrow. See 2 McCarthy on Trademarks and Unfair Competition §§ 11.85–.87 (4th ed. 2012). The court concluded that the title of work can only infringe a trademark if there is source confusion. The title of a work of intellectual property can infringe another author’s mark only if the title falsely implies that the latter author is its origin. Dastar Corp. v. Twentieth Century Fox Film Corp., 539 U.S. 23 (2003). The titles of Truman Capote’s novella Breakfast at Tiffany’s, and the movie of the same name, do not infringe the rights of Tiffany & Co. because no reasonable reader or moviegoer thinks that the jeweler is the source of the book or the movie. The Seventh Circuit therefore affirmed the district court’s dismissal.